Pigeons: Love them or Loath them? To everyday folk, pigeons are seen as unwelcome guests in towns and cities, but like every feathered creature they play a part in the food chain. They are food to many birds of pray and animals in the wild. Pigeons are not fussy eaters, but scavengers, they with eat almost anything and where food is a reliable source, they will move to territories in cities and towns to find food. Because of the availability of littered streets in our country and “bird feeding” like in the stereotypical film “Mary Poppins” they have rapidly become a bird for pest control because once they decide to make an area their home, they can stay there for life. 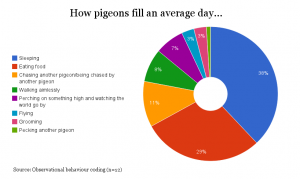 The acidity levels in pigeon poop can erode buildings and public spaces which if not managed, can be costly for councils to replace and repair. Pigeons have long been apart of our history since the Bibles 1st Testament and not to forget its prestigious part in the WW1. With an estimate of 43,000 registered pigeon fanciers in 2013, the bird Columba Livia is a prime bird, not to be under estimated. Here are just a few things we know and love about the pigeon breed. The word pigeon is derived from Latin Pipio which means a peeping chick and belong to the same family as doves but they are relatively larger. They are stout bodied birds and have short necks and slender bills. They have adapted to many parts of the worlds climates and because of their plumage, they can withstand below zero temperatures. Large birds have the ability to fly straight up which may not be common with smaller birds. But this is not true with pigeons as they have the ability to fly vertical. Racing Pigeons are inherently different to the common pigeon and often the tell tale sign is the size. Town pigeons now look plump rather than lean for they will travel less and at less speed. An typical pigeon can display speeds of approximately 40 to 60 miles per hour (mph) and travel approximately 12 miles a day. These birds are able to beat their wings ten times in one second. Because of this fact, the birds are able to maintain a heartbeat of 600 times per minute in duration of sixteen hours without rest. This is an important aspect when considering pigeons for racing. Pigeons unlike other birds, the male and female pair together for life unless they are forcibly separated from their natural surroundings. This is a unique characteristic of male pigeons as they are able to produce milk like fluid which their young ones can feed on. This is a very rare characteristic which is not present in other birds. Unlike most animals or birds where by the responsibility of taking care of the young one rests with mothers/females, this is not true with pigeons. Both the male and female take equal roles in taking care of the young ones. If it is feeding, protecting and doing anything for the young ones, they are shared. The young ones of pigeons are weaned on both the milk from both parents that is the female and the male’s milk like fluid that they produce. This helps the young ones to gain weight quickly and build strength to be a healthy pigeon. When weather conditions are harsh, pigeons are able to cooperate with even other pigeons which may be strangers to them. This is a rare characteristic as the birds welcome and accept outsiders readily to their flock. Pigeons display an intelligent mapping system using their brain. Known to carry out successful messages in the war, scientists do not yet fully understand the birds visual memory. However studies conducted on the species have established that they are able to remember objects or images forever, storing up to three hundred objects. Pigeon fanciers believe that pigeons can be trained, which can help them in completing racing courses.